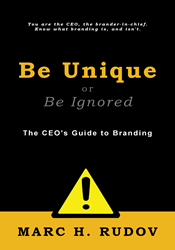 Marc Rudov, branding expert, speaker, radio/TV personality, and author advises CEOs to heed the title of his book on branding: "Be Unique or Be Ignored." A company that blends into the white noise of me-too competition will have unnecessarily high costs of sales, capital, and media. Marc has a gift for clarity, conciseness, punch, and wit.